Crawley Town caretaker managers Filipe Morais and Jimmy Smith enjoyed the reward for a lot of hard work since Harry Kewell left the club. Reds toppled the top of the table team thanks to an own goal by Michael Bostwick late in the first6 half. The home side had Lee Frecklington sent-off early in the second half as Reds went on to defend their lead and continued to create chances. Smith said: “To be on the touchline and give my support to the team which I care so much about. Whether you are playiong or are on the bench or injured like me, we are all in this together. “To keep a clean sheet against the top team shows we are characters who want to work hard. Morais said: “When we took the reins we wanted to take it seriously. “Managing and coaching is definitely something I want to do and I didn’t want to let my reputation down. “We wanted to do the job properly. “We’ve done the job in very difficuly circumstances - it’s hard enough to manage but to play as well is very hard. 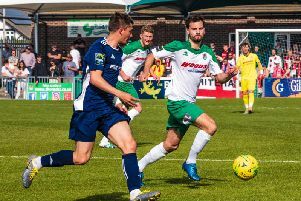 “Jimmy Smith’s helped me a lot and has done so despite suffering a serious injury (cruciate ligament), he stood in the dug-out and gave me someone to bounce ideas off. “Oldham was extremely difficult for us, We could have got a point. We wear our hearts on our sleeve and have seen the progression since then.